Ananda Marga took part as trainers of Yoga at a camp for 150 teachers under the Sports Union of Syria. We took the approach of teaching asanas from the first day and beginning with very simple meditations. By the end of the camp everyone was up dancing kiirtan. 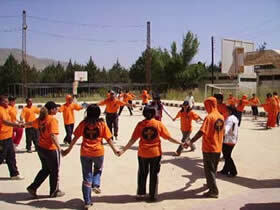 Eventually the group divided into streams, some focusing on aerobics others on games and others on Yoga. We had a good contingent of about 50 – 60 interested teachers out of the total of about 150 participants. They came for meditation every morning at 6:00 despite having non-stop activities all day and parties till two in the morning. The campsite was beautiful but the routine made the students extremely tired which, of course, made meditation, even more difficult, probably impossible for many of them. The style was much like a VSS (Volunteers for Social Service) camp with parade, flag-raising, marching, salutes to officers, etc. But they all seemed to enjoy it. I was really impressed with the spirit of the teachers. They are quite like children themselves and have a much fresher nature than their peers in other countries. They were super friendly and welcoming and full of bubbling energy. Didi Ananda Rainjana did some great workshops about teaching yoga and meditation to children. I focused on teaching meditation for them and Mazen taught them asanas. I got the YES book from Didi Ananda Rama and it is really great. I used it to give a class on teaching values to kids. We also met the top government officials in charge of education of this age-group and lady in charge of sports, music and the arts was very appreciative of the work we did.